During our staycation, the kids and I visited Portland, a half an hour south on the coast. It’s the biggest city in Maine with only 64,000 people. The salted murky scent of the sea hung on the air. Satori Salon on Fore Street was our first stop; it had been almost 6 months since my last haircut. Perhaps I’ve been a little too wrapped up in revising as u like it. I was able to step outside without a hat or even a coat. Can you believe this is February in Maine? After a delicious Japanese lunch at Sapporo, we walked northeast on Commercial Street along the harbor. The busy road transitions to a waterfront path at the ferry station. Check out the windmill on board the tall ship. I've been noticing nautical details since I created a maritime museum curator for as u like it. 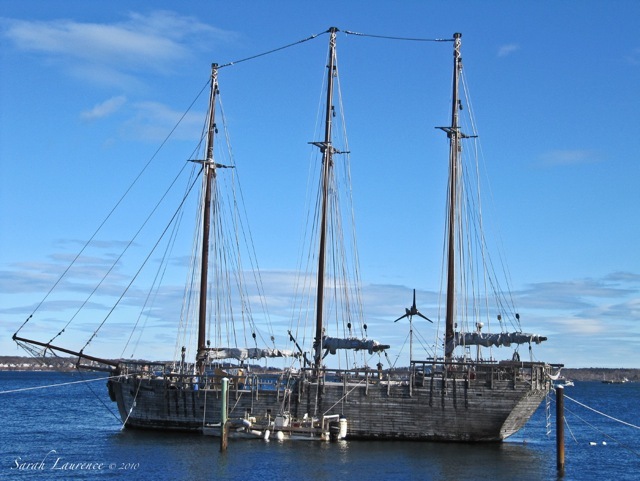 A visit to the Maine Maritime Museum in Bath last year provided inspiration. I love being able to track novel details like that. My blog is a travel log of my works in progress. 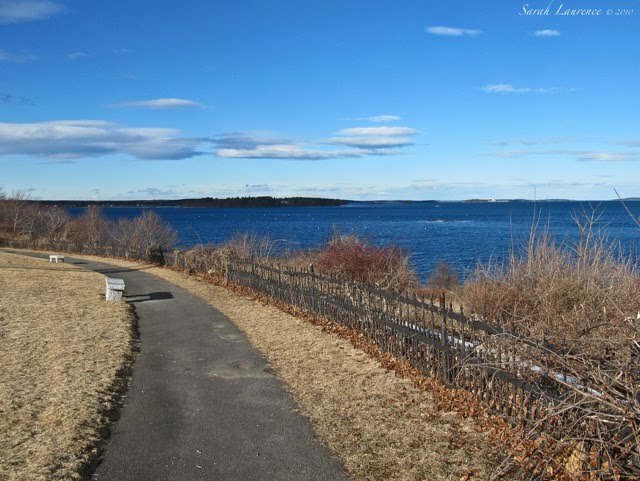 The Eastern Promenade offered a spectacular view of the islands in Casco Bay. The water was a deep winter blue. You might remember the Eastern Prom from a research trip I took for NOT CRICKET. Even when I’m not writing, I’m sketching ideas in my head. Normally the Eastern Prom would be white with snow. Every big storm that has hit the eastern seaboard since mid January has missed Maine. We usually ski over February break, but I have to admit that I enjoyed a week of warm sunshine. Snow mixed with rain is in the forecast today. From the hilltop, you can watch the old Narrow Gauge trains pass. There is a railway museum too. The caboose had to be my last image. Vacation is over so I’m happily back to work on my latest novel. Thanks for the tour. I have heard that Maine is "hurting" for snow, but that something may be coming your way this week. 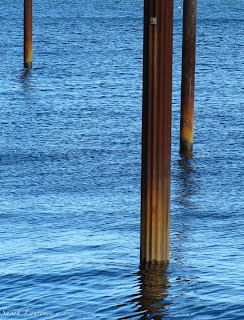 I love the shots of the posts in the water. They speak of a once busier harbor. It's beautiful there. The ocean is REALLY a dark blue. It looks so fresh and pure. I'm back on the coast of Maine and just driving to the store is a picturesque experience. Your pic tour here is a wonderful representation for those that have never been here and should. I can almost smell that murky salted scent myself. You have just described superbly one of my favourite fragrances: the sea. I never ever tire of it. And when it's that deep blue, even better. I feel so much better now, more inspired even. If there's one element lacking from London is a seawall. That's why I love Brighton. Great photos, I worked just north of Portland in Falmouth and loved my drive through Portland from Kennebunkport every morning. But I can't believe there is no snow! Enjoyed taking a break with you. The angle of the first photograph is great. We have had many fabulous family vacations in Maine, but have never been in the middle of winter! I bet the research part of writing a novel is fun ... do you keep files on what you learn to refer back to ... or is it all recorded in your head? Don't you just adore days when the blue of the water matches the blue of the sky?? My footprints are all over all the areas near where you photographed your subject. It's so weird seeing these photos on a blog for me. It feels like all of a sudden there are snapshots out there of my home. Nice job. Les, yes, we love snow in Maine. I swear our snowplows are getting rusty. Another big storm is dumping a foot on NYC to Vermont, but it’s only rain here. If it melts the residual ice, I won’t complain. Portland harbor is busier in the summer. 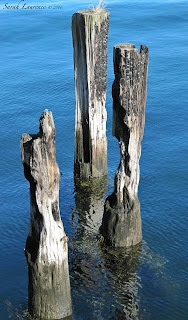 Those are the remains of the old wharf. It’s fun when word verification makes sense – monkeys typing the works of Shakespeare? Tina, the ocean remains winter blue, but the shore is faded to mud season tawny. It’s an odd mix. David, welcome to Maine! Sorry you picked a week of lousy weather. ACIL, yes, the scent of the sea is so special. I loved walking by the Thames when I lived in London and in Oxford, but I missed the ocean. Has it been a year since you visited Havanah? I remember your images so vividly. I hope you get the chance to return soon. Cid, it is a gorgeous drive. The kids badly want a snow day. We’ve only had one this year (December) and the public schools plan on five. Strange weather! Bonnie, nice to share a break with you! Most people prefer visiting Maine in the summer, but it’s less crowded offseason and just as beautiful. The only time I wouldn’t recommend visiting is mud season in late March and April. Late November is bleak too. Pamela, yes, I’m all for blue skies and seas. Kelly, despite the confusion between Portland, Maine and Portland, Oregon, I love them both. Elenka, you honor me with your praise as a local. Thank you! I often find it easier to spot beauty outside my own town because it’s fresh. What a poem about BLUE your pictures create! Love your daughter's photo of you. I bet you now have your jacket back on. I also looked at your updated web site which is very well done. Elizabeth, I do love the blues. Somehow they make me happy. My kids get the best photos of me because they make me feel relaxed. Yes, I was wrapped up in layers while walking Stella in the rain today, but I still got damp. Once again the snow is giving Maine a miss. Maine must be a lovely state with small cities and beautiful coastlines. Delwyn, Australia is on my list of countries to visit due to your blog and my husband’s stories of his gap year there. Your moon photos were gorgeous. LOvely East Coast Portland! How is your snow these days? Dear Sarah, I have found your weblog via Pamela Terry's site and I am so pleased to have done so. Maine and the surrounding area is somewhere that I have little knowledge of and should like to know more. I was interested to read of your travels since travel is so much part of my life, dividing my time between London and Budapest. Although my own weblog is primarily garden based, inevitably my travels creep into my writing.As you remark, ideas are always coming into one's head from discoveries made on one's travels. I shall look forward to future postings. 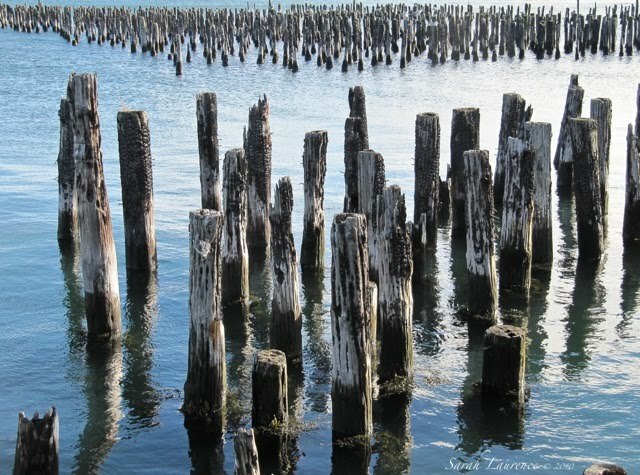 Sarah, your photos are beautiful and so artistic--the first one is especially eye-catching. This has been a strange year for weather--who would have thought that Maine wouldn't have any snow, but Georgia would? Such beautiful scenes must surely provide some inspiration for your writing! Lovely pictures! My favorite one is the train. I live two or three miles from a train track and we hear the train whistle all the time--I love it!! PS My daughter wrote a story about herself and one of the questions she had to answer was: name the places you would like to visit. One place she put was Maine--she has studied Maine in school this year and fell in love with the state. She has asked me if we could visit one day. It is weird not to see snow! 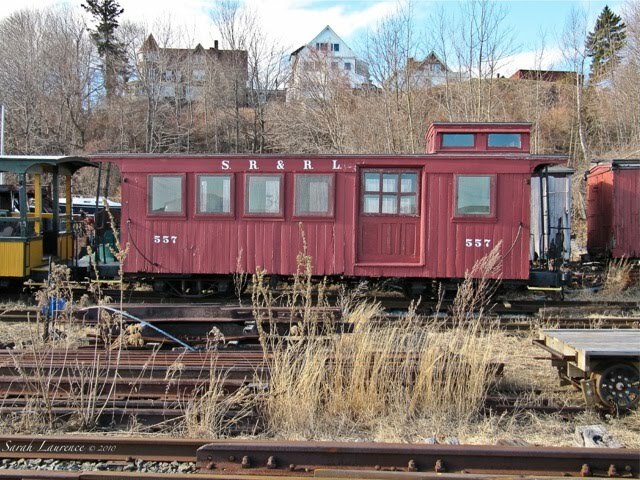 My favorite photo is the red caboose--I just love trains. Sarah, I can see why do not wear make-up. You are absolutely stunning as you are! That beautiful blue is really bracing. You can almost smell the sea coming off of those pictures. I'm amazed that you don't need a coat in February! Maybe it's the joy of the unseasonably warm day, or maybe it's the new haircut, but that is a wonderful picture of you. SARAH REPORTS THAT DUE TO A WIND STORM, SHE IS WITHOUT ELECTRICAL POWER. SHE WILL REPLY TO COMMENTS ONCE POWER IS RESTORED.. Wonderful photos. Did you know I have never been to Maine? I'd really like to visit. These photos are beautiful! I can't get over how blue the sky is in mid-winter! Oh, and jealous that you can be outside without a coat on right now. That is certainly not possible in NYC right now! All, we only got a dusting of snow in the last storm, but 75 mph winds knocked down a lot of trees, including one our property that barely missed our tree house. It’s a relief to have our power back. I’ll be catching up on your blogs this weekend. Lakeviewer, I like the west coast Portland too. We might get more snow tonight, but nothing like the one foot plus in NYC. I heard upstate NY got 3 feet. This must be our least snowy winter ever in Maine. Edith, welcome! I enjoyed visiting your blog too and will be back. It’s nice to hear how you found me. Pamela has a lovely blog too. Rose, it has been a most unusual winter. I was missing the snow and skiing, but now I’m into my spring, or at least mud season, mindset. The birds are coming back and the chipmunks are out of hibernation. The grass is turning green although we had a few flurries today. 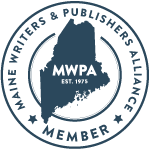 No matter what the season, Maine is the best place to live as a writer/artist. Tracy, I love trains too. After reading storybooks as a child, I thought it was a magical place as well. I do hope you and your family can visit. Let me know if you do. Cynthia, I guessed from your profile image that you were a train fan too. Angie, thank you! I have to admit to wearing Body Shop lipstick in that photo. Bee, I should not have tempted fate with my near bare body. We are back to jacket weather. My daughter captured the joy of a perfect day in that photo. Thank you! When I went to the hairdresser, I brought the photo of the 2 of us in England last June. I looked very happy in that picture too. Anonymous/Dad, thanks for updating my readers! 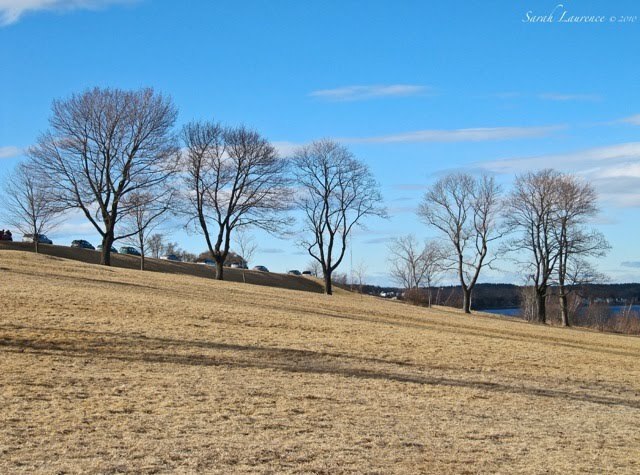 Booksnyc, Maine has the most gorgeous blue skies in the fall and winter. I heard about the big snowfall from my family in NY. It sounds like we swapped winters this year. Sarah, I can smell and feel the salty air from your wonderful post and photos. Hopefully we can get to Maine within the next several years and experience some of its beauty. Hi i just follow your comment somewhere. Your photos are great, they always come excellent when taken by artists. The first one is really awesome. The other posts i will return and read later. work first, hehe. thanks. You are enjoying some incredible weather, Sarah! Thank you for sharing your beautiful BLUE skies. I really enjoy staycations. I am definitely more refreshed. We just got back from London and thought it was fun, I am exhausted!! Beautiful photos! I'm hoping to visit Maine with my family this summer--our first time! Di, you live in a beautiful place too. Andrea, welcome to my blog and thank you! I’ll come visit yours soon. JAPRA, it’s been very stormy since posting. I should not have tempted fate. I’m looking forward to hearing about London. Alyssa, thank you. Let me know if you are passing through Brunswick. Thanks for thinking of me, but I don’t accept awards on my blog. I prefer to select the content I post myself. "Kama mamake" in Kiswahili, means that your daughter is taking after you; "just like mom" talented in writing and photography! MS, I love that expression! Thank you from both of us.